June 6, 2016 – It is not news that Earth has been warming rapidly over the last 100 years as greenhouse gases accumulate in the atmosphere. But not all warming has been happening equally rapidly everywhere. Temperatures in the Arctic, for example, are rising much faster than the rest of the planet. Patrick Taylor, an atmospheric scientist at NASA’s Langley Research Center in Hampton, Virginia, says that one of the main factors for the Arctic’s rapid warming is how clouds interact with frozen seawater, known as sea ice. These interactions influence the Arctic’s albedo feedback, which is a term scientists use to describe changes in the amount of solar energy absorbed by the Earth due to changes in the Earth’s albedo caused by increased greenhouse gases. The Earth’s albedo is basically the fraction of sunlight that it reflects. Understanding what influences the Arctic’s albedo is particularly important, as its bright snow and ice make it one of the regions with the highest capacity to reflect solar energy. Taylor’s observations were possible thanks in part to new technology like NASA’s CALIPSO and CloudSat missions and an enhanced data product fusing together these unique instruments, which have been orbiting the planet since 2006 to provide more accurate measurements of clouds. “The unique ability of CALIPSO and CloudSat instruments to provide very accurate knowledge of the vertical distribution of clouds was critical to this study,” Taylor said. Previous ideas about the Arctic were that its warming would likely be buffered — or slowed down — during summer by clouds, and Taylor explained why it’s reasonable to think that would happen in the summer. Arctic summers mean more sunlight to melt sea ice, which historically has covered huge areas of the ocean. Less sea ice results in the ocean absorbing more solar energy, causing it to warm, but then also allows for more water to evaporate into the atmosphere. Clouds are a two-edged sword when it comes to climate change. They have both cooling and warming effects not just in the Arctic but across the entire planet. During the day, white and bright clouds reflect part of the sunlight hitting the planet back into space. At night, however, they act as a blanket that doesn’t completely allow day-accumulated heat to escape into space. This “blanket” mechanism is evident in just about any place on Earth. Although further research needs to be conducted, Taylor said the increased clouds he observed in the fall seasons could slow down the process of refreezing sea ice through the winter. 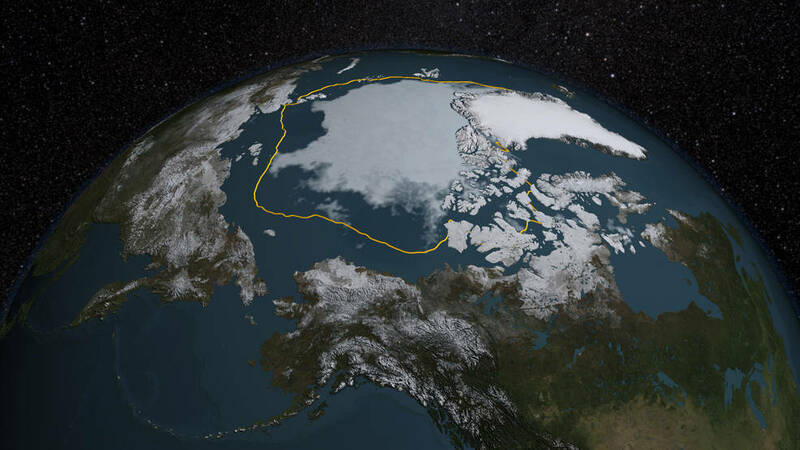 Slow refreezing could translate into summers with less and thinner sea ice — something NASA satellites have already detected. Taylor also said one thing that is becoming more evident, thanks in part to his research, is that sea ice isn’t controlling cloud behavior in the Arctic as much as previously thought. His study shows that different meteorological conditions like temperature, humidity and winds may be influencing Arctic clouds almost 10 times more than sea ice. These conditions, which contribute to what is known as atmospheric stability, influence whether clouds form and remain close to the sea ice or ocean surface. Taylor said high atmospheric stability restricts a lot of energy exchanges between the surface and the atmosphere. Previous research on sea ice and cloud dynamics in the Arctic studied relationships between monthly averaged sea ice and clouds. Looking at the same months over several years, for example, they analyzed whether an area showed increases or decreases in clouds given its sea ice concentrations. Taylor’s study involved a more detailed approach gathering satellite imagery within shorter time spans and sorted them out by what he called atmospheric state regimes. In other words, he classified images of clouds and sea ice over the Arctic depending on whether conditions included certain amounts of humidity, temperature, or wind patterns. Taylor said the study’s design is very much like a preschool sorting activity, where teachers ask children to sort colored blocks into their respective color bins. Taylor is now trying to find out what’s the implication of his results to Arctic energy budget and surface temperature, which are important factors to consider when simulating the future of Arctic sea ice. “We found some cloud changes in the fall and some responses of clouds to sea ice, so the next question is: How important are they?” he said.